The Olive Garden used to have the most amazing seafood dip, San Remo Dip, on their menu. Like any good chain, they got rid of it. We were appalled, then we went to the interwebs and found our own recipe. All in all, a perfectly suitable substitute. A little on the thin side, so next time I would simmer for a longer amount of time till it's nice and thick. Yum! Serve with your favorite bread sticks, sliced baguette or crackers. In a two quart sauce pan on medium low temperature, heat olive oil and blend in flour. Add to flour the liquids that were reserve from the shrimp and crab, stir well. To sauce, add cubed cream cheese, salt, crushed garlic, horseradish, and stir until smooth. Add Asiago and Parmesan cheeses and stir until smooth. 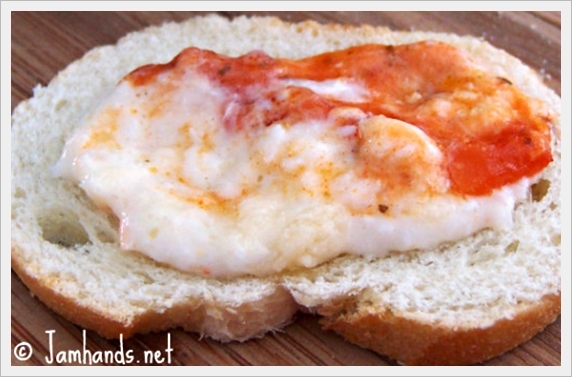 When the cheese have been melted and sauce is smooth, add shrimp and crab and mix well. Let simmer until heated through. Finally add half and half a little at a time until the seafood sauce starts to simmer and begins to resemble warm pudding. Let sauce simmer for 12 - 15 minutes. Stir sauce so it will not scorch on bottom. In a shallow baking dish 9" diameter, spray with non-stick spray and place drained marinara sauce and carefully spoon seafood sauce on top. Sprinkle with freshly shredded Parmesan cheese and place in a preheated oven at 325, for 10 - 15 minutes, until heated through. Dip should not brown on top. Serve with bread. I have been a follower for a while! I love your blog! You share some yumminess! I would love it if you stopped by and became my newest follower! Oooh, this looks good too! Great app for a party! Oh my gosh I about cried when they took it off the menu! It was hands down my favorite- I always just ordered the dip for myself and a salad! I can't wait to try this!!!! OH MY WORD. That looks delish! YUM!! i'm going to have to try this!!! thanks for sharing! I think we would be licking the bowl clean! Man alive this sounds so good! Thanks for linking up to Hunk of Meat Monday! Sounds phenomenal! The San Remo dip is bringing back memories of the seafood crepes that my mom used to make. I may have to give the trip down memory lane an extended tour and make this dip for our next "Happy Hour"!